There is no question that America is the birthplace and land of fast food industry. Is that something to be proud about? It should because we have created a new style of something that is as basic as life preservation; nourishment. So many people have linked fast food to obesity, totally unfair. It’s like saying books have caused so many eye problems. To identify the real culprit, we have to go back in time are trace the development of dining. In the early years, both man and food were healthy. The beef had less fat because they had to run away from the hunters if they wished to live longer. Running around in the wild and running for their lives kept them lean with minimal body fat. On the other hand, the hunters had their own share of exercise chasing their food around the plains. There were no freezers and preservatives to keep the hunted meat from spoiling so, it was always a cycle of hunting and eating. It is safe to say that every amount of calories they ingested was burned during hunting. They deserved everything they ate. As healthy as they were, they didn’t live long enough because they were strong enough to kill each other for the food others had collected for themselves. Even then, man has always had that tendency to rely on what’s easier and more convenient versus what was healthy. The bible very much predicted everything. As soon as man bit the apple from the tree of knowledge everything worked against him. All of man’s inventions had its share of convenience for society. But, these conveniences have robbed us of what we needed; exercise. Because of the freezer and preservatives, man no longer had to hunt prior to every meal. We can hunt our food in hordes and stock them for our several days’, weeks’ and months’ meals. As society has become more complex with other needs beyond the basics, our profession has become more varied to the point that there are other people who can do the hunting for us. Most of us can just sit behind desks and look smart. Not only did man become unhealthy, so did our sources of food. The hunters have become smarter so as not to hunt any more. Animals can be bred and they can be bred to become bigger, heavier and fatter for greater monetary gains. And so, we too are being bred to become bigger, heavier and fatter. The only thing that fast food did is offer convenience. By the very term that describes this modern eating style, we can have our meals fast whenever we feel like it. In that sense, fastfood is unlikely to be bad for us. If the convenience of fast food wasn’t invented, the only thing that wouldn’t have happened is the frequency of the meals in that they wouldn’t have been as much. Most people can no longer imagine the concept of cooking three times a day for the three basic meals. Without fast food, most people will be even eating less than they needed to. Without McDonald’s or Burger King drive-thru, most people will skip breakfast and maybe even dinner. Look at it this way. If we didn’t have cars and we had to walk or run to the fast food restaurants for our meals, will we be as unhealthy as we are now? There was this guy who appeared in Oprah who ate 17 Big Macs a day while walking to his office and walking back to his house. He wasn’t fat nor had any diseases related to over-eating. This proves that there is no such thing as overeating, only under-exercising. So what’s to blame based on that analogy? Is it the fastfood restaurant or, is the invention of the car. It’s normal to eat breakfast, lunch and dinner. 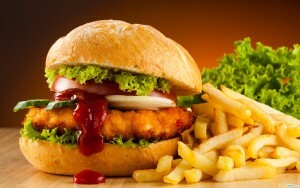 Eating these meals at home, in your friend’s house or in fast food restaurants has very little difference. What’s making us unhealthy is what we are doing, or rather what we are not doing between these meals. It’s easy to blame it on fast food simply because we know they won’t go away. If there was a slim chance that they’d fade away, critics won’t talk trash as much because they themselves survive on fast foods. Athletes can eat as much Big Macs, Whoppers and KFCs as they want. Michael Phelps was on a 12,500 daily calorie diet during his Olympic gold medal picking years. Athletes don’t complain much about unhealthy foods because their health rests on their hands and so are ours. So who’s our enemy, is it the food or the chair? The moment people start admitting that neither the food nor the chair is the real culprit but our decision to eat the food and sit on the chair all day long that’s creating the problem, the more likely are we to be able to solve our health problems.